Grainger the developer will be showing their plans for the 22-storey Apex tower at the Pueblito Paisa cafe at the indoor market at Wards Corner on Thursday 12th March at 5pm. We’re sure lots of you will like to come and meet them in person and discuss what they will be doing for the people of Tottenham. Who wants a 22-storey tower block right here? Real soon. Last week the fight to save Wards Corner moved one step closer. Haringey Council granted us planning permission to restore the Wards Department store. A massive thank you to everyone who helped us get to this stage! Your support and involvement is always appreciated. The enthusiasm and support for the Community Plan has been astounding and it continues to grow. In just a week we’ve had over 50 people leave their comments on the Council’s planning website, clearly showing them that local people want to see community-led development at Wards Corner and throughout the rest of Tottenham. This Thursday 27th March we are celebrating the submission of the Community Plan with a special launch event, offering you a chance to step inside the Community Plan and take a virtual tour. We’ve been working with Creative Citizens and using the StickyWorld.com platform to bring you this opportunity and to explore innovative new ways to engage people in planning. It is vital that people are empowered to make decisions about planning in the areas they live and work, and this requires more than surveys and consultation on policies. StickyWorld.com offers people a visually engaging way to view and comment on plans, it also makes these comments public and allows people to discuss the issues that are important to them. 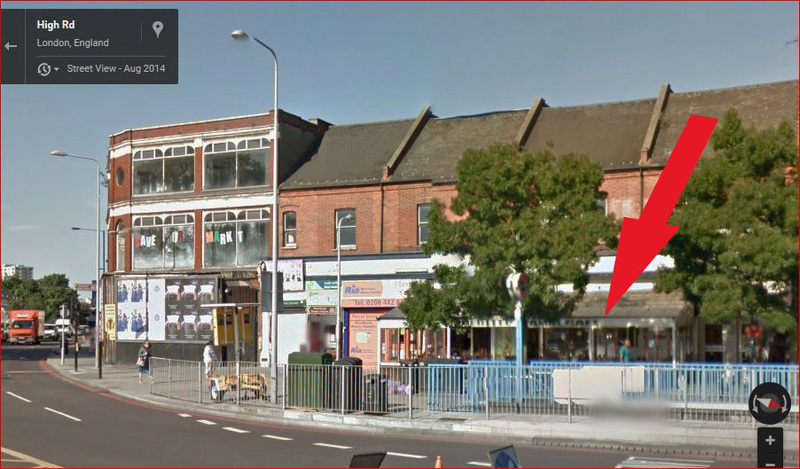 So make sure you come along on Thursday and add your comments to the discussion about the future of Wards Corner. There will be a short presentation of the plans, lots of people on hand to guide you through the website, and free refreshments too! The site was created with support from The Open University and the Creative Citizens research project funded by the Arts and Humanities Research Council. The WCC is made up of and supported by residents and a wide range of local groups including residents associations, trader organisations, Tottenham Civic Society, Tottenham Conservation Area Advisory Committee, Pedro Achata Trust, Pueblito Paisa, The Seven Sisters Multicultural Market Traders, The Tottenham Traders Association, Tottenham & Wood Green Friends Of the Earth, Sustainable Haringey, Haringey Living Streets, Seven Sisters Permaculture, The Civic Trust, The Victorian Society, English Heritage, The New Economics Foundation, The Ethical Property Foundation, Bioregional, Planning Aid For London, Parity Projects, Representatives of political parties and other groups. /\ click to download pdf file. SoTo news includes the Plevna Cres/Ermine Rd planning proposal, West Green Rd shopfronts, the N15 squirrel, and Wards Corner update. You’ll also want to know about the slash-and-burn plans for High Rd West, the Spurs development. Wednesday 28 August is a critical day for Wards Corner Community Coalition. After our application for Judicial Review of Haringey Council’s decision to grant planning permission for the Grainger development was turned down by a Judge at the Royal Courts of Justice in April, we submitted an application to seek permission to appeal this decision. We will receive the Judge’s answer in Court tomorrow! The more people attend the hearing the better, to show that Wards Corner matters to the people of Tottenham, and beyond. Please come show your support for Wards Corner and WCC! Please pass this information on via your networks – the more the better! Background information is here. In a sentence, the market, shops and houses above Seven Sisters tube station are threatened with being demolished in favour of LBH’s preferred ‘regeneration’ – private-flat tower blocks and a clone-town High Street. Fundraising Jumble Sale at the market by Seven Sisters tube. Sunday 7 July 11.00am – 4.00pm. 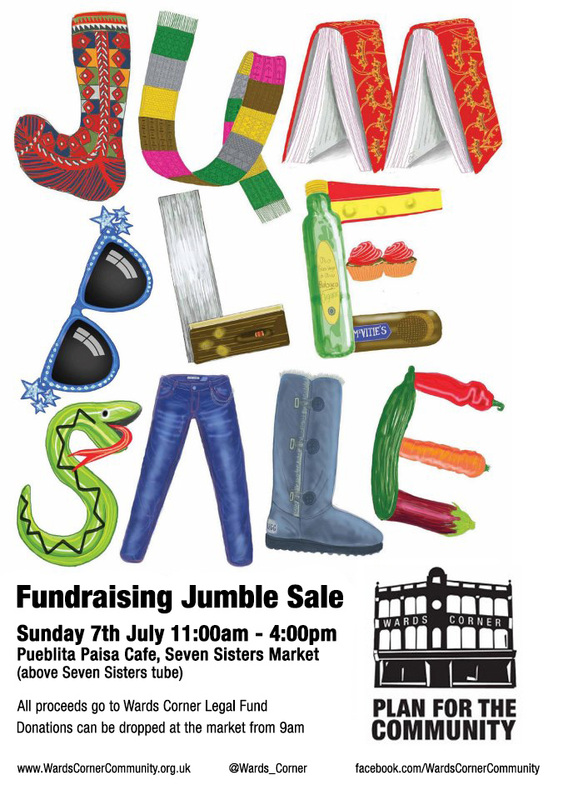 The jumble will be raising funds to support the Wards Corner Legal Fund. Please do donate any good quality portable items, eg: clothes, books, plants etc on the day from 9am. Please donate anything you can spare that might raise funds at this crucial time. Small, easily carried items, in useable condition only please. All items will be gratefully received on the day from 9am.